This area is under the extension service of our Logistics Partner. Please call +91-9840425767 or write to us at support@choosemybicycle.com to get details of additional costs involved. Want us to notify you when this product is back in stock? The Pre-order option is available for new 2018 launches that have not yet been released in the market for sale. ChooseMyBicycle ensures that the particular pre-ordered product is blocked on priority basis with the brand, from the first shipment lot available to be dispatched in the country. The pre-ordered products will be delivered within 7 - 14 working days, starting from 22nd of April 2018. The delivery pin code cannot be changed after placing the order. Pre-orders can be done through full online payments in advance, as the same order is confirmed and blocked with the manufacturer. On successfully placing your order, you will get an official order summary that will confirm the pre-order. This document will be considered to be the final order confirmation for all future references. In the case of unforeseen delay from ChooseMyBicycle.com or the manufacturer, our supply chain team will keep you informed and updated, every step of the way. If you have more queries regarding the Pre-order option, feel free to call our Sales Team at +91-8939574077, or Chat With Us by selecting the chat option on the bottom right section of the website. These offers are free with the purchase of the Fuji Absolute 1.1 (2016) Bicycle. Want To Customize Your Accessories? You can pay for this product via EMI, using one of the credit card options listed below. Your respective bank will convert this payment into an EMI in 3-5 working days. The option to select an EMI is available at the Final Payment Gateway Page (After Checkout). *EMI terms and conditions are as per your individual cards/banks. Want To Know More About EMI and Finance Options? You can pay for this product through a No Cost EMI, using your existing Bajaj Finserv card. The option to select the tenure of EMI is available at the checkout page, where you will need to click on the button that reads 'Pay Via Bajaj Finserv'. Would You Like To Know More About EMI and Finance Options? All terms and conditions with regard to your card, will be as per the guidelines and terms of Bajaj Finserv. We Have Received Your Message. Our Expert Will Get In Touch With You Shortly. Have A Nice Day. We've got your message. You request would be processed and you would be hearing from us at the earliest. Wishing you a Great Day ahead! The Fuji Absolute 1.1 (2016) comes with a Fuji A2-SL custom butted alloy frame. The Fuji Absolute 1.1 (2016) comes with Shimano RS-700 Rapid fire, 11-speed shifters, and Shimano 105 front and rear derailleurs. The Fuji Absolute 1.1 (2016) comes with front and rear disc brakes. The Fuji Absolute 1.1 (2016) comes with a FC-770 carbon blade fork. The Fuji Absolute 1.1 (2016) comes with Vera Helios 700x28c, 30tpi with phalanx flat protection and vera corsa DPD22 double wall rims. The Price of the Fuji Absolute 1.1 (2016) is Rs.74990. Who should buy this bicycle? This is an ideal bicycle for anyone looking to ride inside the city for commuting or fitness purposes and also for longer weekend rides. This is a great bicycle for people who are into cycling as a regular activity and are looking to get a well-performing hybrid bicycle that will last and deliver. Fuji Bicycles was established in Japan in 1899. Fuji Bicycles aim to create the best bicycles using high quality materials and Components. 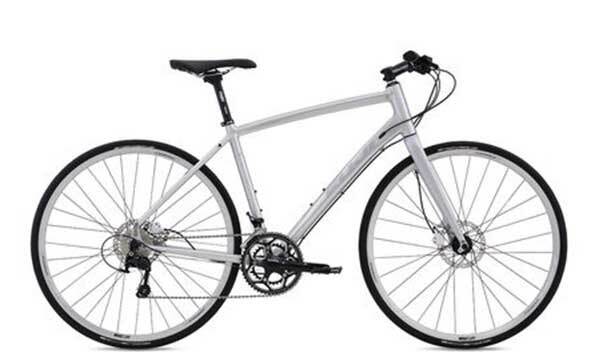 Fuji Bicycles has a wide range of Road, Hybrid and MTB Bicycles for the Indian Market. 1. Are there any delivery charges? There are no delivery charges for bicycles but we do charge a nominal delivery charge of Rs.50 for all accessories and apparel. 2. In what condition will I get the Fuji Absolute 1.1 (2016)? All bicycles delivered by us will be fully fitted and ready to ride. In some rare cases we will send an unassembled bicycle and will send a technician to your house for assembling the bicycle for free. 3. I want to buy a bicycle but I am not able to make my decision on which one to buy. Do not worry, we have our dedicated chat support with bicycle experts on our website available to help you make the perfect choice with your bicycle. You can reach out to our Bicycle Experts through our Chat on the bottom right corner of your screen. 4. Do these bicycle come with warranty? 5. Do you have a Cash on Delivery facility? Currently we don’t provide Cash on Delivery facility but we are working on it and are hoping to get this payment option soon. 6. How will I know if Fuji Absolute 1.1 (2016) will fit me without riding it? 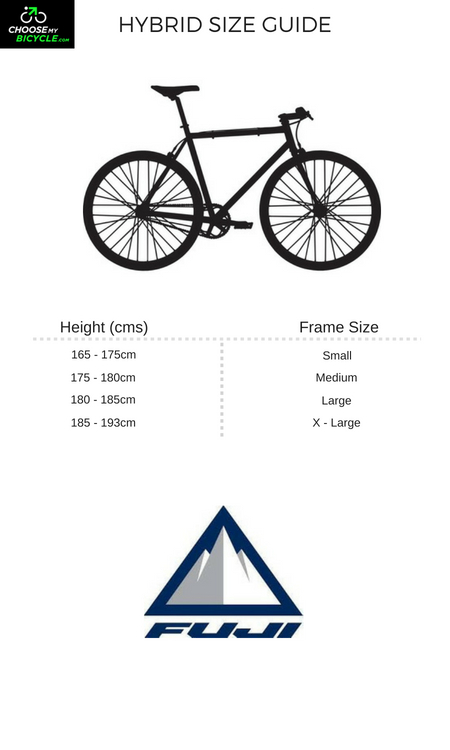 Our team has done extensive research on sizing charts for all types of bicycles. If you tell us your height we will be able to help you in selecting the suitable size. 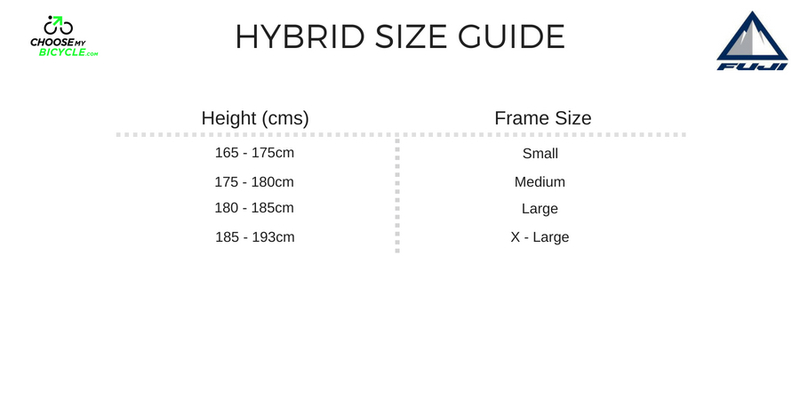 You can also refer to our sizing chart for this particular category of bicycle by clicking here. 7. How long will it take for me to receive the Fuji Absolute 1.1 (2016)? The delivery time for every cycle differs according to the location. Once the shipment is dispatched we will send you a personalized tracking link for you to track your package. 8. What if I receive a damaged product? If in the unfortunate circumstance that the product you receive is damaged, contact us via support@choosemybicycle.com or through our chat option on the website. We will assure free returns in case of defects after checking necessary proof of the damage. 9. The payment has gone through but I have not received any confirmation? Do not worry, your money will be safe. Contact us immediately via support@choosemybicycle.com or through our chat option on the website and we will help you with the status of your order. Interested in submitting a review for this product? If you find the content inappropriate for this particular review and you think it should be removed, help us with some details below. This information will be sent to choosemybicycle.com and necessary action would be taken. and send you an email once we've confirmed on this! Please fill up the details below and submit your review for this product. This must be a technical glitch.